What does it take to ignite the spark of creativity? Throughout history mesmerizing women known as muses bewitched artists, inspiring them to create works of great beauty. For an artist, the muse is one of the most important relationships he can have. A muse provides a focus around which images and dreams can be created. A muse is someone who can be the subject of the romantic ideals that made him an artist in the first place. The artist can then take those images and feelings and feed them to his guitar and voice (or paint, etc.) to see what comes out. The muse and artist become one, both as important as each other, according to David Bailey. I often think about muses, their effect on my creativity. I have the sense they are mystical yet mysteriously provide me with the will and the way to create. I came face to face with a muse on April 16, 2015. While my husband Monte and I strolled along the walkway around Lake Eola in Orlando, Florida. I was admiring the view of the downtown lake and giving in to my fascination with the swans, especially the pairs which had just birthed their babies. 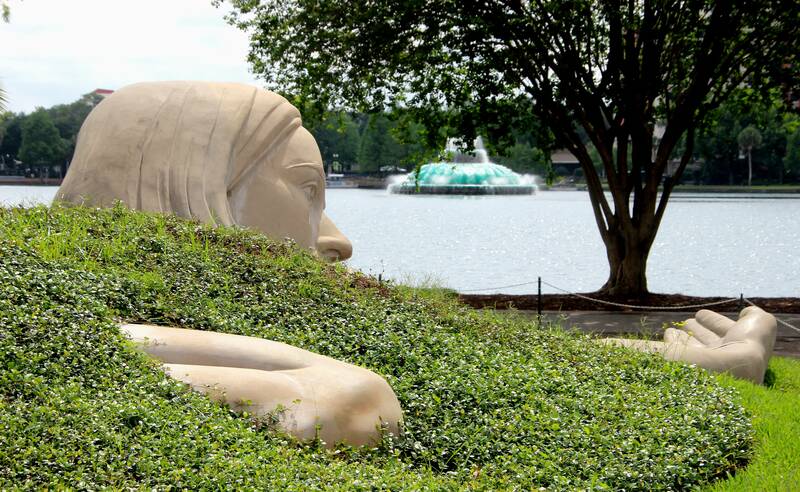 Glancing away from the water I was face to face with an oversized white statue of a woman covered in a blanket of growing greenery. Her left leg was stretched out gracefully, its foot bare, its thigh covered with the grass blanket. The other leg was bent so only its knee and a small part of the thigh and lower leg protruded from under her green blanket. Her left arm was bent, its hand resting on a rock pillow. Her right arm was extended, its cupped hand positioned as if to accept some gift. Her head lay on a patch of soft brown earth. She had straight hair styled in the page boy cut of the 1950s. Her face was soft, peaceful, with an inviting, thoughtful…yes, musing…expression. Her presence seems natural in this park in the center of a big city. If she were a real person she’d be someone I’d like to befriend. 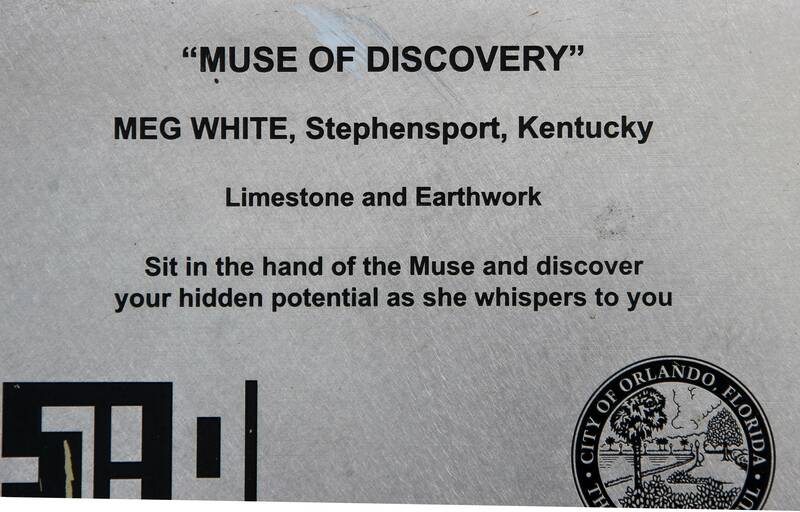 A sign, introducing her as the Muse of Discovery, invited us to sit in her hand and discover our hidden potential while she whispers to us. I…we…all creative persons…were expected to be her gift. I longed to accept the invitation but ironically another sign told said Do Not, that the Grass is Resting. Regardless, I was tempted to cross the silver chain link fence to sit in her hand because I knew I would never again have this opportunity—this was our one and only trek to Orlando. I sadly overcame my temptation, knowing if I gave in to it my disobedience would mar my gift of me to the muse. However, I have since wondered what she would have whispered in my ear had I been permitted to sit in her cupped hand. Upon returning home I researched this Muse of Discovery, a. k. a. The Discovery. 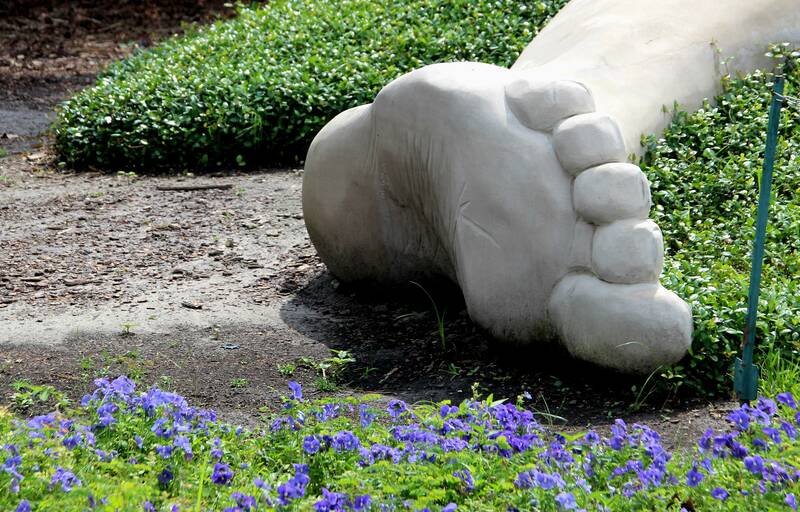 The head of this 40-foot long giantess weighs about 20,000 pounds. Her sculptor intends her to recall one of the ancient Muses of Greek myth, the goddesses of creativity. 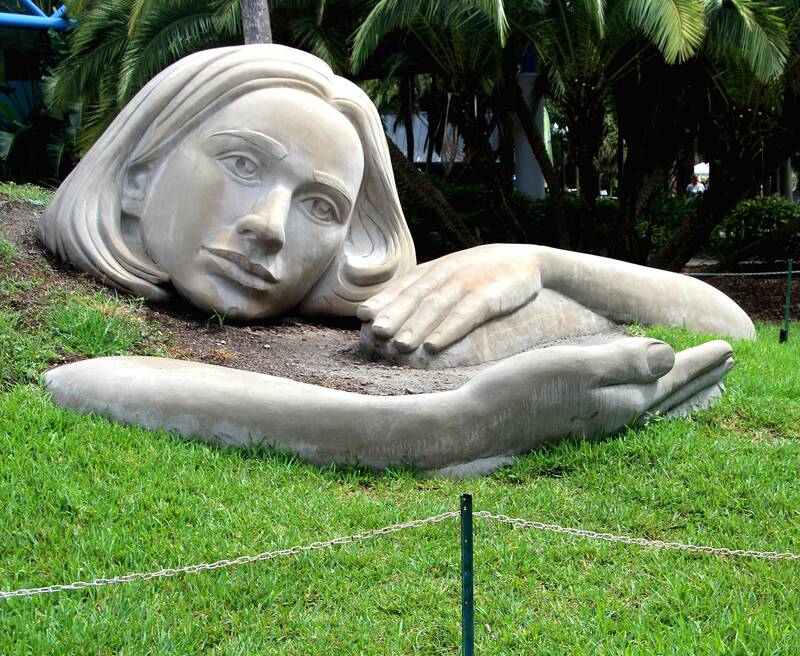 The Muse of Discovery is one of eight See Art Orlando’s privately-funded permanent contemporary public art sculptures scattered throughout Downtown Orlando*. The art project began when Orlando Mayor Buddy Dyer and art lover Jennifer Quigley brainstormed ways to improve Orlando, what would bring pride, boost the economy, and strengthen the city’s cultural core. 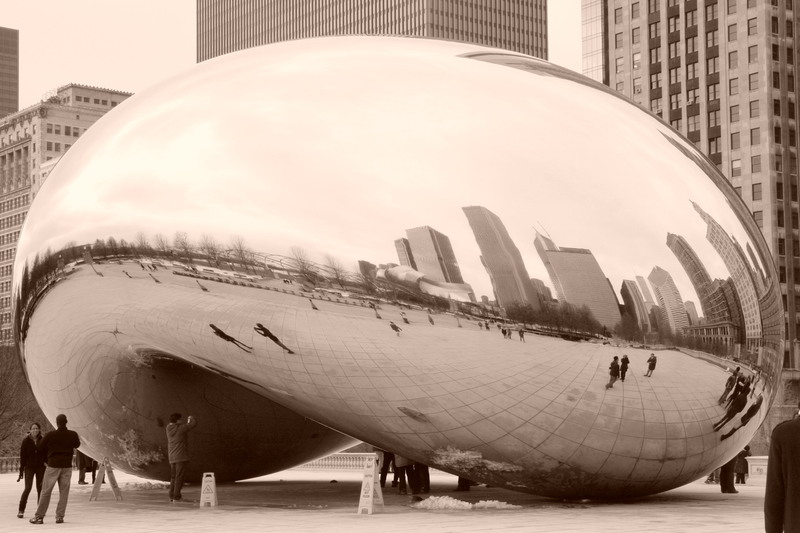 Mayor Dyer realized other cities of similar size have iconic sculptures—for example, Chicago has Cloud Gate, commonly referred to as The Bean. Why couldn’t Orlando have something iconic like that? 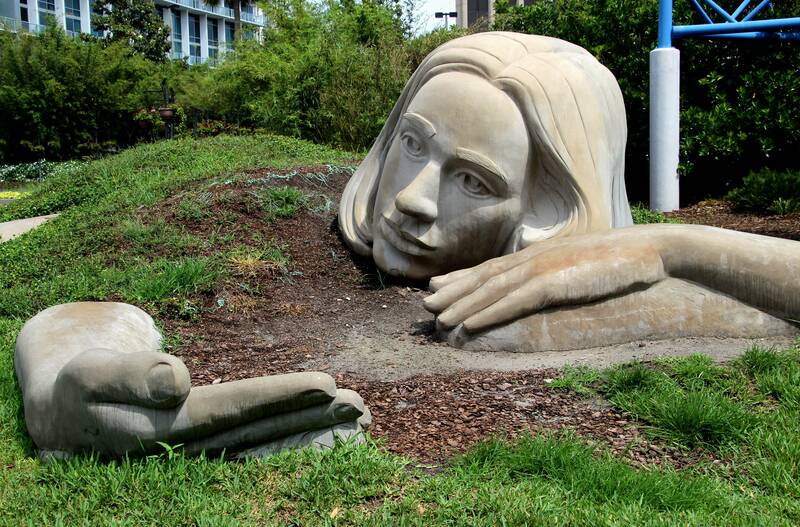 Their answer to their search became: outdoor public sculpture. They organized a board of directors. Seeking the best artists in the world to the directors held an international call to artists who could represent the city’s melting pot, its creative and multi-cultural population. They received responses from artists in 36 states and 16 countries. Eight were chosen, from as far away as China, to design and build the sculptures. The sculptures were all funded by private donations, and See Art Orlando is a not for profit corporation. 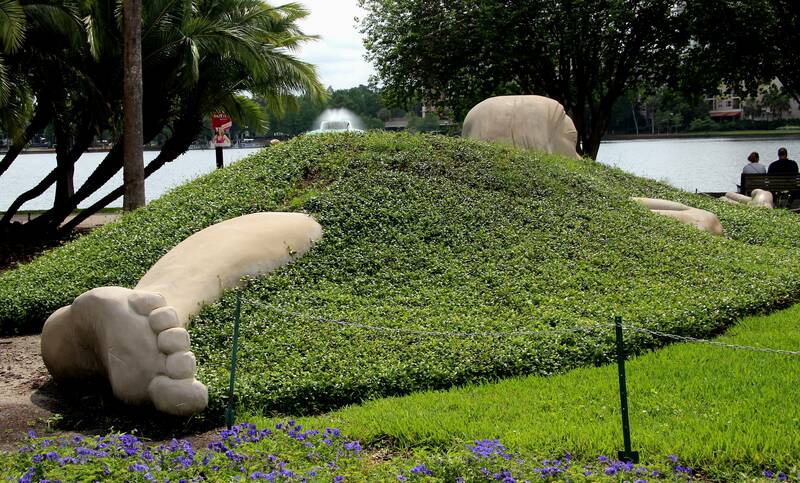 The sculptures, installed around Lake Eola in a collection that is walkable in less than an hour, were unveiled November 18, 2013. 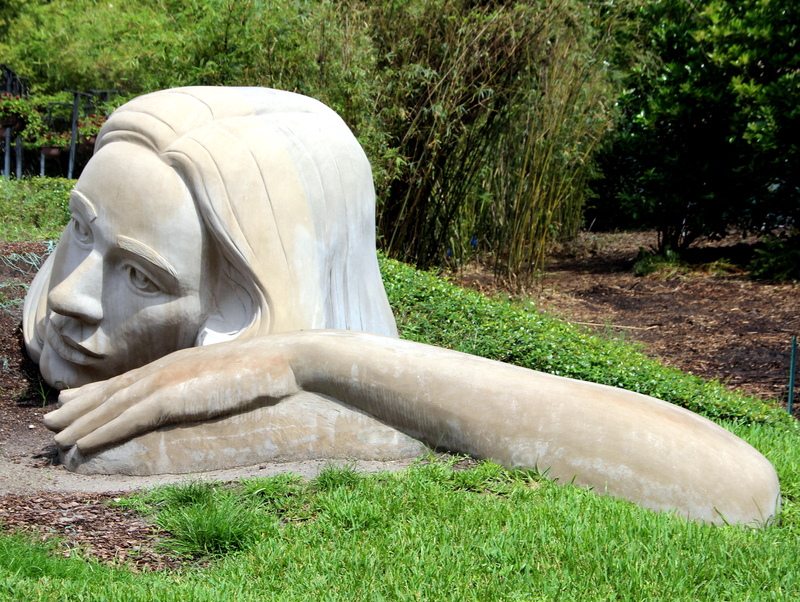 The Muse of Discovery, created by Meg White of Stephensport, Kentucky, is located at the front of Lake Eola on Rosalind Avenue between Washington and Robinson. Kentucky artist. 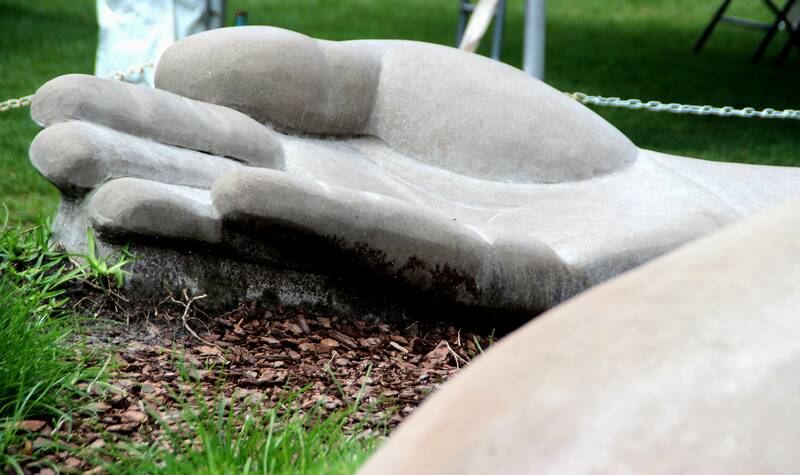 Constructed of Indiana limestone and earthwork, it is the gift of the Wayne M Densch Charities. 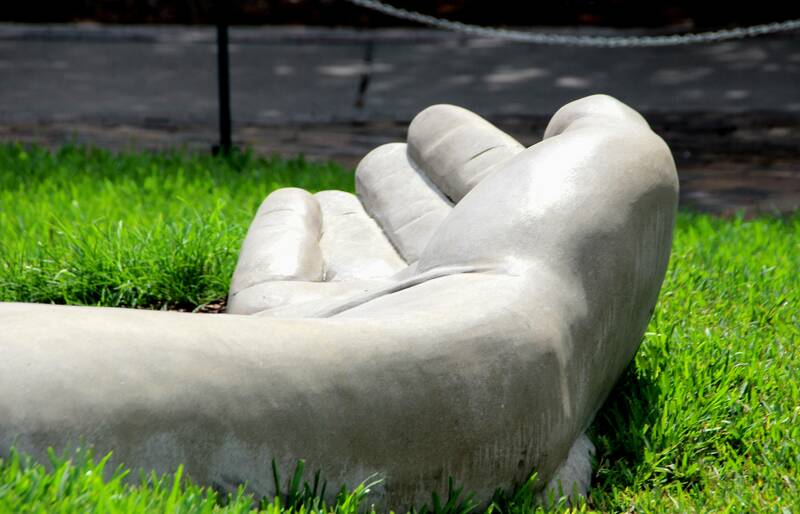 The WordPress writing prompt for October 1, 2015, was Immortalized in Stone: your personal sculptor is carving a person, thing or event from the last year of your life. What’s the statue of and what makes it so significant? Meg White would be my sculptor, as she has already created a piece of art to my liking. However, I would have her add something to her creation: she could place me sitting in the cupped hand of the Muse of Discovery, listening to the whisper in my ear. Take Flight depicts a flock of beautiful birds ascending into the Orlando sky. Created by Kentucky-based artist Douwe Blumberg. 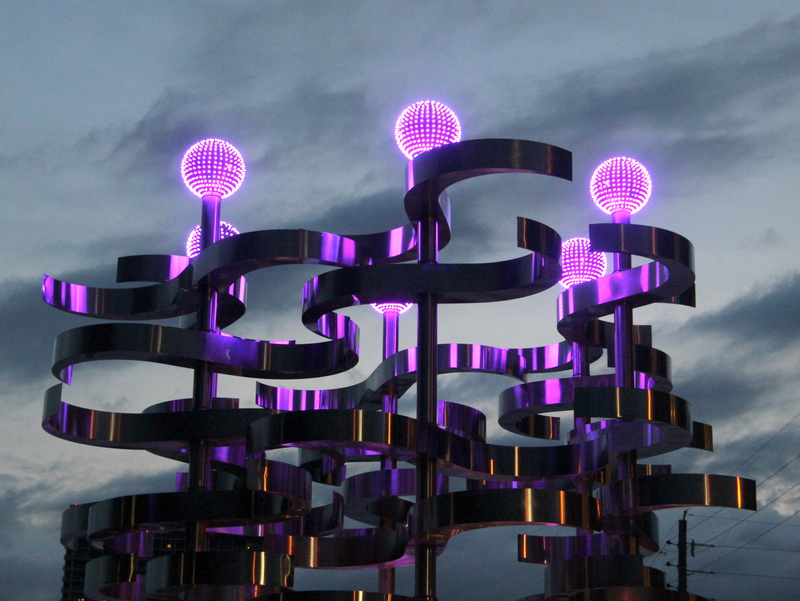 Union is a group of six moveable, aluminum poles topped with curved “wings.” The artist is Ralfonso Gschwend, cofounder of the Kinetic Art Organization. Cedar of Lebanon, a tree with mirrored branches made from stainless steel and hand bent sprinkler pipes. By local artist Jake Harmeling, the only local artist selected. Centered is a massive metal piece with a central yellow “sun” that looks both modern and ancient at the same time. The artist is CJ Rench. Global Convergence, a 10-foot-wide aluminum globe is decorated with shoal bass and is lit from within. Deedee Morrison, the artist, is from Birmingham, AL. 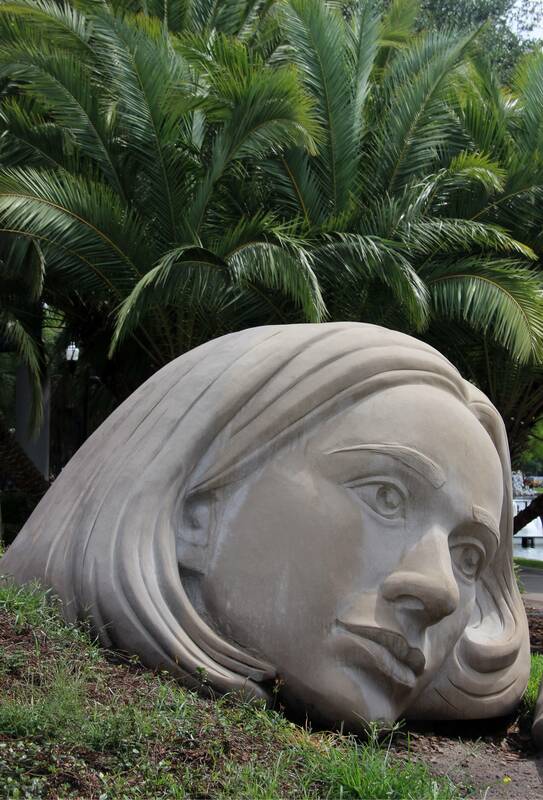 This entry was posted in Feature Articles, TRAVEL, WORDPRESS PROMPTS, Wordpress writing and tagged All posts, dp_prompt/immortalized-in-stone/, Journaling, Lake Eola in Orlando Fla., Latest post, Lifestream, Miscellaneous, Muses & creativity, postaday2015, See Art Orlando, The Muse of Discovery by Meg White. Bookmark the permalink.